My favorite holiday is almost here. Yes, I'm talking about Christmas. I love the weather, the music, the lights, the family time, the gifts given and received...I love the feeling. 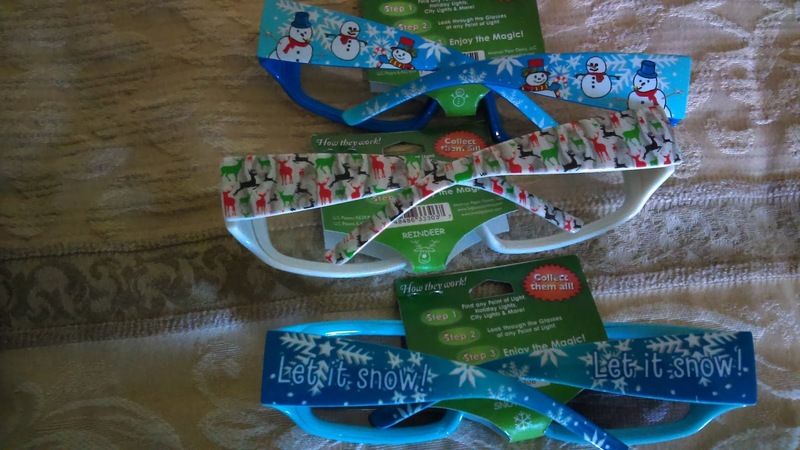 I was introduced to these specs last year and they were a huge hit with my family. This is everything that came in the package. 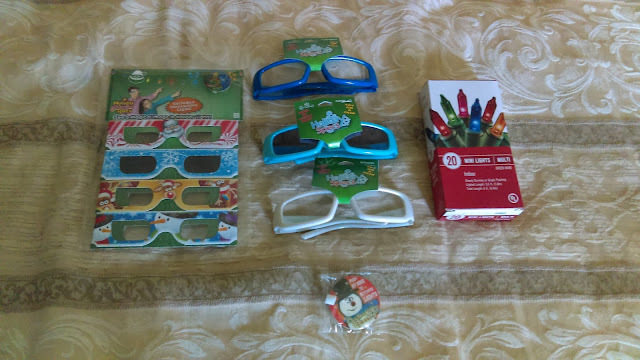 A pack of magic specs, 3 plastic glasses, Christmas lights and two buttons that light up. The reason I was given two of these cute little pins and the lights is so that they could be used with the glasses and paper specs. 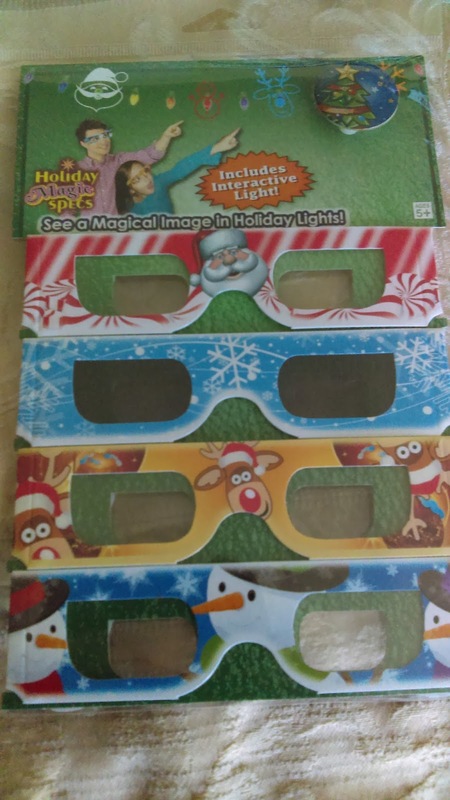 I tried to get a picture of what you can see through these glasses when you look at lights, but it was tough. You see, when you look through the lenses of either the paper specs or plastic glasses, you see magical little images instead of plain lights. 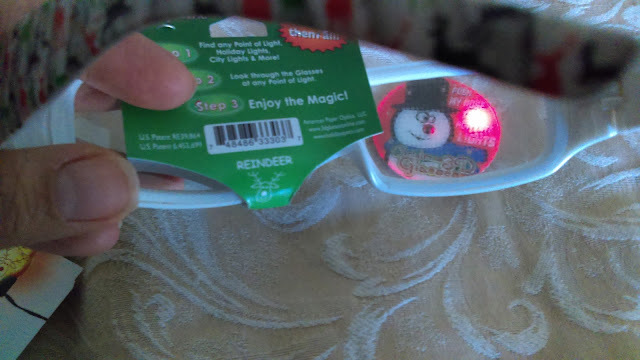 The ones in the picture above would be showing you little Reindeer heads, as shown on the green tag, when you look at the Christmas lights. 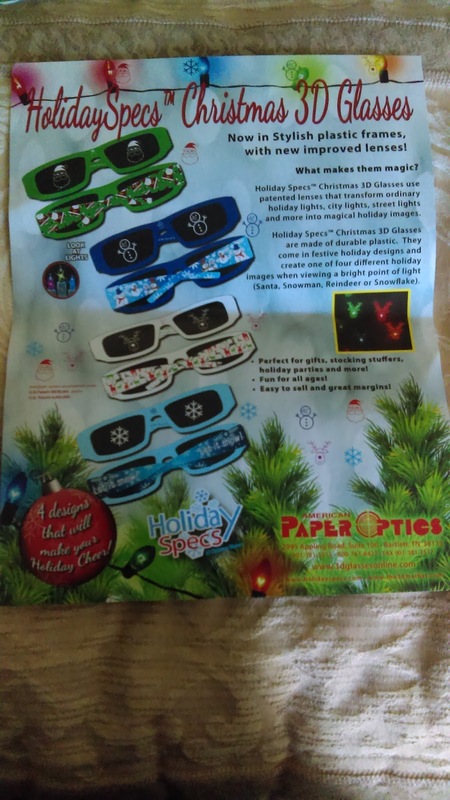 From top to bottom, as shown on the specs, you would see Santa, snowflakes, reindeer, and snowmen when looking through the lenses. So fun. Great for all ages. As it says above, you can use these glasses with street lights, Christmas lights, city lights, and more! It's really cool how they work. Last year, I put some in my gave a couple of pairs to my son and some of our other young relatives, as stocking stuffers. 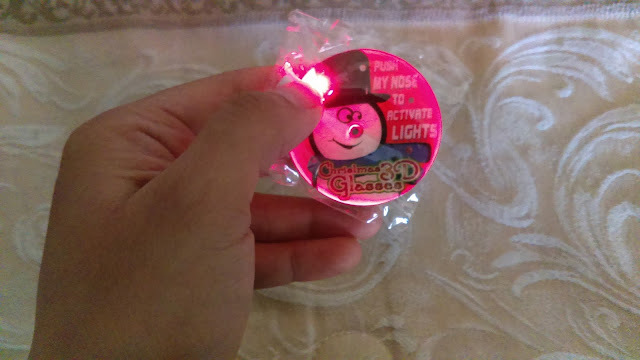 They wore them for hours, while we rode around looking at lights. They absolutely loved them. These are the newest products that we've tried, since last year, we only had the thinner ones. These will obviously last longer than the others, and can probably be used for years to come. These will make Christmas even more memorable this year. Visit their website to learn more and get your own!